After suffering rough patches thanks to Unity and Syndicate, Ubisoft was finally able to bounce back with Assassin’s Creed Origins. The game, which was nominated for a number of categories at The Game Awards 2017 and the PlayStation Game of the Year 2017 awards, is one of the best and most beautiful looking games of 2017. Now, the company is all set to ride high on the game’s huge success, by finally announcing the release dates of the game’s upcoming new DLCs. 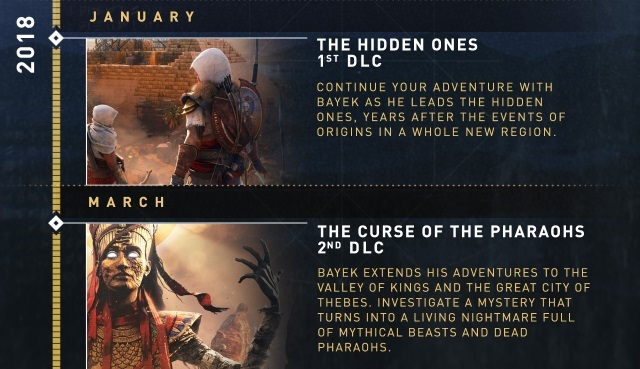 As reported by IGN, Ubisoft has announced the release dates for The Hidden Ones, The Curse of the Pharaohs, and the free Discovery Tour. Starting January 23, players will be able to purchase The Hidden Ones DLC for $10, which is a story-driven expansion set four years after the events of Origins as the Brotherhood faces off against Roman forces occupying the Sinai, a brand new region. The expansion will also increase the level cap to 45 and introduce new weapons and mounts, new levels for crafted gear, and a new outfit for Bayek. Next up, we have the Discovery Tour which will be available as a free update to Assassin’s Creed owners starting February 20. Discovery Tour will allow players to explore ancient Egypt and learn about the culture, traditions, and lives of its people in a living museum. For players who don’t own the game, the Discovery Tour can also be purchased separately as a standalone game for $20. Lastly, the much anticipated Curse of the Pharaohs DLC will be available for $20 on March 6. In it, players will travel to Thebes to investigate an ancient curse that is reanimating the dead. Bayek, the game’s protagonist, will have to contend with risen pharoahs, beasts, and more. It will also expand the level cap to 55 and includes new outfits, gear, and weapons, all themed on Egyptian myth. While the Discovery Mode comes as a free upgrade to Assassin’s Creed Origins owners, they can also choose to buy the Season Pass for $40 which includes both The Hidden Ones and The Curse of the Pharaoh, along with 500 Helix Credits and the exclusive Calamity Blade weapon. So, which expansion packs for Assassin’s Creed Origins are you the most excited about? Let us know in the comments down below.